Mix together dried pineapple, dried cherries, golden raisins and dried apricots in a large bowl. Add sugar, active dry yeast, flour and salt. Heat milk, butter, honey and lemon juice to 120°F in a saucepan; stir into the mix. Mix in 2 lightly beaten eggs and vanilla extract; cover and let rise until doubled in size, about 1 hour. Bake at 350°F until a toothpick inserted in the middle comes out clean, about 45 minutes. Cool before slicing. There are so many different types of holiday breads to celebrate the season with, but I have to say that my favorite is panettone. Panettone is Italian sweet bread studded with dried fruits. Rick Steves told me on TV recently that in Italy on Christmas, children go from door to door in their neighborhoods giving away homemade panettone to the elderly who don’t have anyone with whom to share the holidays. Here across the pond, panettone can be found all over the place this time of year, from the grocery store to chain café-bakeries. Some make it in the traditional cupola shape, while others make it in any old loaf pan (like me). Some bake it with citrusy fruits like lemon and candied orange; others use whatever dried fruits they have in the pantry (again, like me). There are many great things about panettone – like how it stores well at room temperature for up to a week, and that it’s absolutely delicious – but the greatest is that when it comes to homemade holiday breads, this is the hardest recipe to mess up. If you’re looking to bake a festive bread but don’t have much time, talent, energy or all of the above, panettone is your new best friend. Panettone is prepared like a quick bread, but its consistency after baking is dense and spongy, almost like a sourdough. The dough itself is quite mild in flavor, but the chopped, dried fruits studded throughout the loaf give it a sweet, tangy taste. 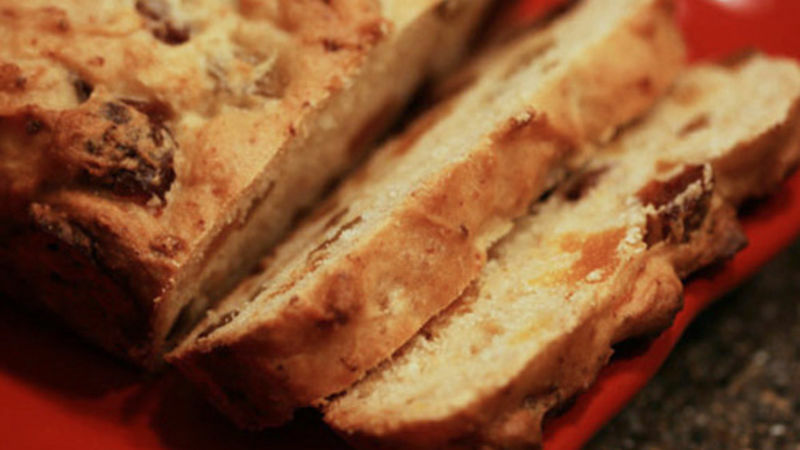 Some say it’s better than stollen, another traditional holiday bread. Panettone tastes just like Christmas, in bread form!